The Layer setting specifies how overlapping graphic overlays appear in the video. The service overlays graphics with higher values for Layer on top of overlays with lower values for Layer. Each overlay must have a unique value for Layer; you can't assign the same layer number to more than one overlay. The following illustration shows how the value for Layer affects how a graphic overlay appears in relation to other overlays. 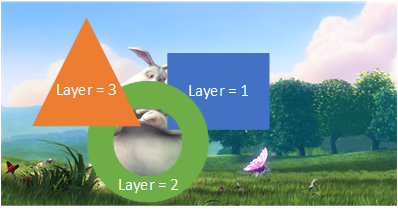 The triangle has the highest value for Layer and appears on top, obscuring the video frame and all graphic overlays with lower values of Layer. Set up your graphic overlay as described in Still Graphic Overlay. For Layer, enter a whole number from 0 to 99. You can use each number only once. Each graphic overlay must have its own layer.